Straight from the chefs and shopkeepers who know best, here are the varieties—hard, soft and stinky—worth hunting down the next time you're in town. If there was ever any doubt as to just how much Wisconsin dominates the American dairy market, consider this: the state's myriad cheesemakers produced a record-setting 3.37 billion pounds of the good stuff in 2017. That's 26.6 percent of the country's entire output, and the sixteenth straight year of marked gains from the land of milk. Which is all well and good if you're someone who benefits from all those artisanal blocks and wheels, but what about us consumers? Walking into a specialty grocer or cheese shop and seeing nothing but the very best can be overwhelming to some, and induce panic in others. That's where the pros—from a butcher to a baker to a brewer—from the Madison region come in. They've shared their best recommendations, so you at least know where to start. Here is a rundown of the hard, soft and stinky varieties worth hunting down the next time you're in town…. Hunter of Underground Food Collective agrees:"One of my favorite days of the year is when Rush Creek Reserve is released by Uplands Dairy. You can only get it for a few months—from October through the end of December—but that's what makes it special. It's incredibly rich and buttery, but because they age it for 60 days and use raw milk, it has the funk I appreciate in a soft cheese. Or as my 5-year-old daughter calls it, the "stinky cheese"—of which see eats an entire wheel. 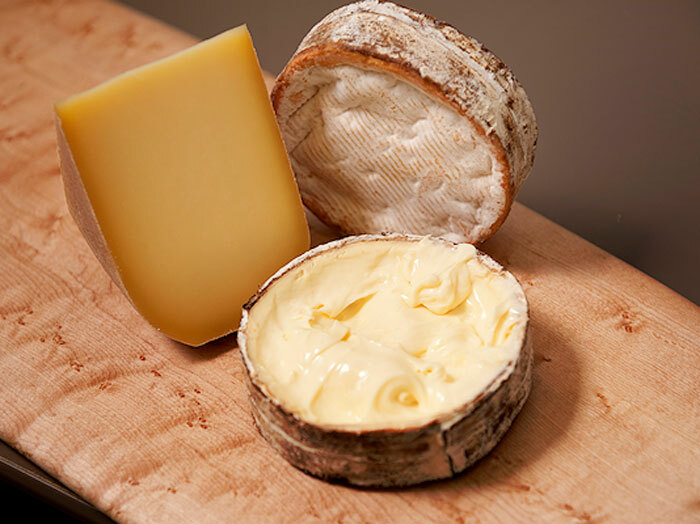 Since Rush Creek is a limited release, we love having it at the restaurant; it's one of the most versatile cheeses we have to cook with and pairs amazingly with root vegetables." "There are so many exciting things are going on in Wisconsin. Since we opened the shop more than 11 years ago, the most encouraging change is the new generation of cheesemakers that have made their mark. These small-batch artisan producers are leading the way by not only focusing on cow's milk cheeses, but also on a variety of sheep and goat milk products. Virginie Ok, owner, La Kitchenette, agrees:"Coming from France, you have some expectations of course. And Wisconsin didn't disappoint! I was amazed to discover all these local makers, perfecting techniques imported from Europe and developing cheeses unique to Wisconsin. One of my favorites is Bleu Mont Dairy's Bandaged Cheddar. It is extra tasty and flavorful, a little like Comté from France. The aging brings the crunch—literally, like small salt crystals—and is balanced by floral flavors." We'll consider that our next assignment!